A beautiful bouquet of Pink Garden Roses, White Anemones, Hydrangeas, Babies Breath and Silver Dollar Eucalyptus. Call us today to schedule your consultation appointment! Beautiful Bridesmaid Bouquets of pink Garden Roses White Anemones, and Babies Breath wrapped in satin! Call us today to set up your Bridal Consultation! Beautiful Arbor Arrangement of Silver Dollar Eucalyptus, Italian Ruscus Greenery with White Hydrangeas, White Roses, White spray Roses, and more! 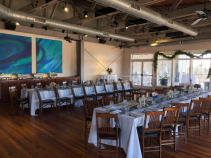 Call us today to schedule your wedding consultation! 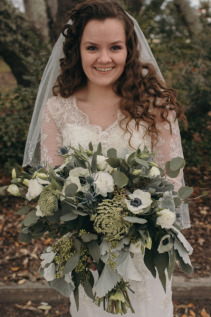 This lush winter bouquet is made up of white Anemones, White Lisianthisus, Queen Anne's Lace, Thistle, Dusty Miller and beautiful assorted Eucalyptus! 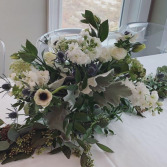 This lush centerpiece arrangement is a perfect combination of Anemones, White Stock, Lisianthisus, Thistle, Dusty Miller, and assorted Eucalyptus! These beautiful 8 Foot long Garlands were and made here at Sandy's! They Consist of a beautiful assortment of Eucalyptus, Italian Ruscus and more! This Lush handmade Garland consists of Seeded Eucalyptus, Silver Dollar Eucalyptus, Italian Ruscus and more! This stunning cascade bouquet is made up of pink and creme garden roses, beautiful Queene Anne's Lace, Bluplurium, and a stunning assortment of lush greenery. Lovely Cascading Bridal Bouquet of Pink and Creme Garden Roses, stunning Queen Anne's Lace, Bluplurium, and an assortment of lush greenery! 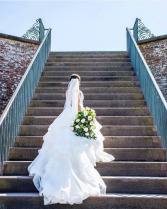 Call us today to schedule your bridal Consulation. 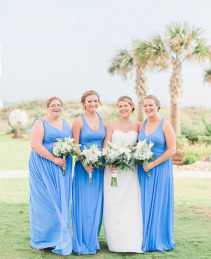 White, blue and sage green flowers make a great combination for this coastal wedding! A light and breezy coastal look with these arbor swag arrangements! Made up of beautiful Blue Hydrangeas, White Roses, Bluplurium and lush greenery! Call us today to schedule your Bridal Consultation. This Bridal Party went with a very fun and unique style of assorted Ferns and greenery for their bouquets! 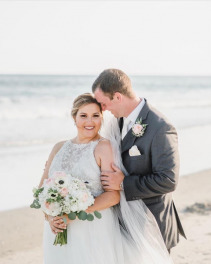 The Bride's Bouquet consists of a stunning assortment of Pink and Creme Ranunculus, Dusty Miller, Peach Garden Roses, Italian Ruscus, and more! 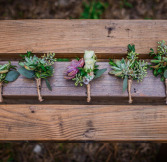 These are not your everyday Boutineers! 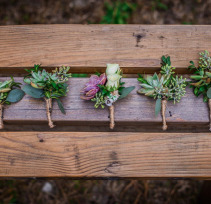 They are a combination of succulents, spray roses and seeded eucalyptus hand wrapped in twine! 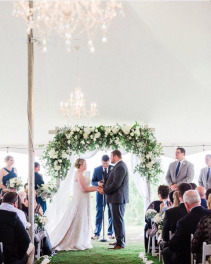 This was such a sweet Reception! 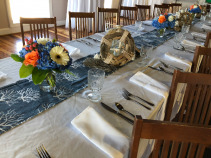 We made Bright and colorful centerpieces with blue hydrangeas, Coral roses, and Gerbers and more! We also made hand-tied fresh garland consisting of Italian ruscus, salal, and other lush greens! These colorful centerpieces consist of beautiful blue hydrangeas, coral roses, peach hypericum berries, gerber daisies and more! 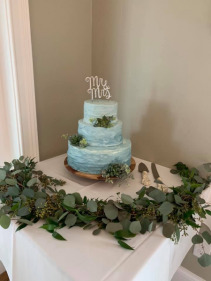 Make Sandy's Flower Shoppe your first choice for premium fresh flowers and upscale design artistry for your dream wedding and all your special occasions! At Sandy's Flower Shoppe, we go the extra mile to ensure your flowers are more than a memory. Our wedding consultants can offer lots of beautiful style suggestions in an effort to create the overall look you hope to achieve. Wedding flowers are something you will remember for a lifetime. These are the flowers that will always trigger special memories of the day you shared, so it's important to pick something perfectly you. 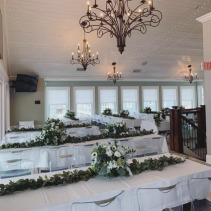 Just as important is choosing the right florist and Sandy's Flower Shoppe is ready to help you! Call us in advance at (252) 247-3323 to schedule a consultation. We'd love to help you start planning your dream wedding or your next successful event. We want to provide you with flowers that are as beautifully unforgettable as your wedding day memories will be. Call Sandy's Flower Shoppe today!